Who or what has been the most helpful or encouraging person or book? This is a very hard question, because at different stages in my life different people have been helpful and encouraging. So let me go back to the beginning and talk about the person who was first used of God to steer me toward giving my life to missions. It would be a nine-year journey for me, and this guy was the first pebble in the avalanche that would slide us toward Argentina. This guy’s name is Aaron Butner. Aaron and I met at Tabernacle Baptist College in Greenville, SC. He was a funny guy; it was never dull in the dorms with Aaron around. There was only one thing that I disliked about Aaron–he was a Duke Blue Devil fan. I come from a family that has deep UNC Tarheel roots. Even with this great gap of college basketball rivalry between us, Aaron became one of my best friends. When Emily and I got married in 2004, Aaron moved to Arequipa, Peru for a six-month internship with missionary Austin Gardner. He was able to come back to the states at least once during this time and when he came to the Greenville area sometimes he would stay at my house. He would stay up late at night telling me stories of the mission field in Peru. He shared everything he was learning there and I was gobbling it up like a fat kid at Thanksgiving. He invited me to a mini-summit at Zion Hill Baptist Church in Greenville. There at that mini-summit I heard Chris Gardner and Austin Gardner speak. I loved it and learned a lot from it. I remember Chris preaching from the book of Joshua about how much of the land there was that needed to be conquered for Christ through missions. I remember Brother Gardner talking about how discipleship worked, and that it was the key to multiplying believers and churches on the mission field. That day was a small turning point in my life. 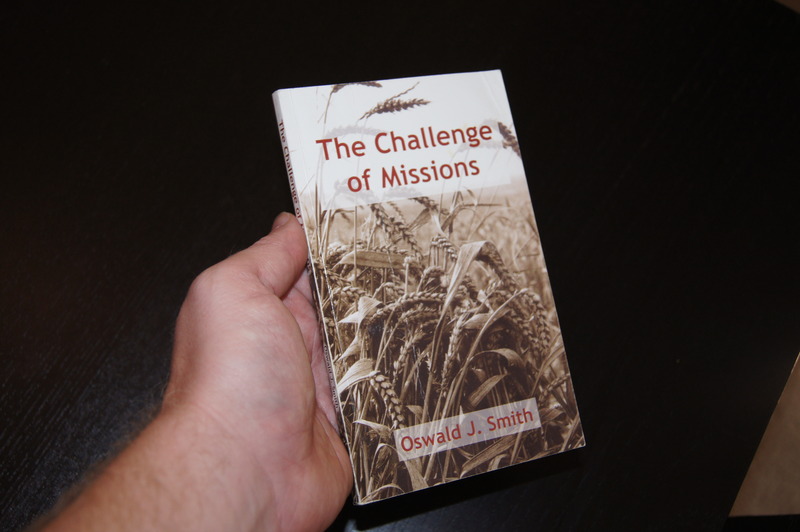 Aaron also gave me a book called “The Challenge of Missions” by Oswald J. Smith. Aaron wrote on the inside of the book, “Shawn, you are a great friend. God bless you and Emily.” This was apparently before my family of two grew into a small tribe. I read the book and underlined things in it. I still have the book with me. As a matter of fact, Vision Baptist Missions has obtained permission to do a reprint of this book, and now I have been able to go and give it out to pastors and young men in churches that I visit. “So many of us are localized in our outlook”. The book Aaron gave me. It’s only 127 pages, but dynamite comes in small packages. In summary, there are three things that Aaron did that greatly influenced me. 1. He spoke passionately about missions and serving Christ. 2. He invited me to an event where missions was promoted in an exciting manner. 3. He gave me a book, something that I could take home with me and always have access to. By the way, Aaron is not a missionary. He is now a big-time banker in Durham, North Carolina. You don’t have to be a missionary to excite and encourage people about missions. If you are not a missionary, you may be thinking “There is nothing I can do,” or “Missions is not my job because I’m not a missionary.” If you are a Christian, however, then the Great Commission that our Savior gave us in Mark 16:15 is your responsibility. You can pray and give so others can go. You can get involved and get excited about missions and be an encouragement to others about this great ministry that we all have. Who knows? Years later, you might end up the subject of a blog post about how influential you were in the life of a missionary. This is post is part 4 in the series “Answering Vision” and is taken from the panel discussion questions from the missions conference at Vision Baptist Church you can read part 3 here. First, I am not a big-time banker… Just a big banker, as in a man who has battled the bulge since infancy. Third, if you wanted money you should have just asked; not try to butter me up with a blog post.